The tart vegetal character of broccoli rabe plays off nicely against the mellow Italian flavors of the chicken and orecchetti. A strong roasted garlic oil is great for adding additional flavor to this dish. Combine and mix the soy sauce, minced garlic, and mustard, and thoroughly coat the chicken breasts. Set aside. Cook and drain four small portions of orecchetti, about .75 cups of finished pasta per serving. Set aside. Trim the broccoli rabe of the stems and set aside. Prepare a pot and vegetable steamer basket and heat water to boiling while you work on the chicken. Pour the flour and Parmesan cheese onto a dinner plate and mix with your fingers. Add Kosher or sea salt and fresh ground pepper to taste. Heat a frying pan large enough for the four chicken breasts. Add about 2 tablespoons of olive oil and 1 tablespoon of butter to the frying pan and heat the pan on low while you work on the chicken. 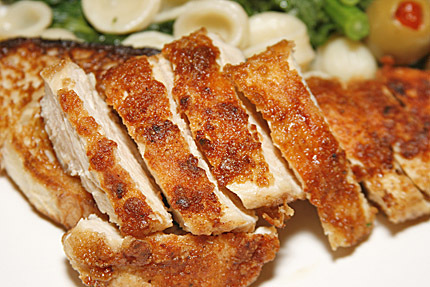 Roll each piece of marinated chicken breast in the flour and Parmesan mixture, and place into the hot frying pan. Sauté the chicken about 4 minutes on each side, until the chicken has a golden brown crust. Add olive oil if necessary to keep the pieces from sticking to the pan as they brown. Total cooking times will vary, depending on how thick the chicken breast are. Cut 4 thick slices of ciabatta or other Italian bread, and toast. Set aside. After you flip the chicken breast for the first time, add the brocolli rabe to the hot steamer pot, and steam for about 5 minutes, until the rabe has turned bright green, but has not wilted too much from the cooking. Cut the heat, remove the steamer basket and rabe, spill the water out of the pot, rinse the pot with cold water to cool the metal, and dump the rabe from the steamer basket into the pot. Brush each toasted piece of bread lightly with garlic oil, and set in the center of each serving plate. Add the orecchetti to the pot of rabe, and drizzle the rabe and pasta mixture with roasted garlic olive oil. Toss the pasta and rabe to mix. After the second side of the chicken is done (about 7-8 minutes of cooking total), check a thick piece for doneness – the chicken should have just barely turned from pink to white in the thickest center of the piece – and remove from heat if the chicken is done. 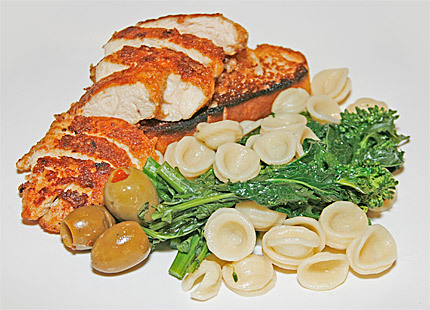 Slice each chicken piece, and plate the dish with the toasted bread and olives as garnish.